We are going to kick off Leeds Bicycle Film Club with the 1979 cult classic Breaking Away, which many years ago I can remember watching and jumping on my ‘racer’ and tearing around the hills of South Wales imagining that I was taking on all comers. A Midwest American college town in the 1970s is the setting for this coming-of-age tale about four working-class teens who are trying to escape their parents’ working class fates. Class consciousness and conflicts abound, as local college kids refer disparagingly to the protagonists as “Cutters.” The blue-collar stone-cutters literally built the homes the rich kids live in and the college that these kids attend. Dennis Christopher is Dave, a relentlessly fanatical bicyclist who has suddenly decided to embrace all things Italian (right down to a tacky Italian accent), Paul Dooley gives the film’s most memorable performance as Dave’s exasperated father. His character undergoes a quiet transformation from a cynical, weary, and worried fellow into a cagey optimist. Dooley was overlooked come Oscar time, though Barbara Barrie was nominated for her memorably wistful turn as Dave’s mother. 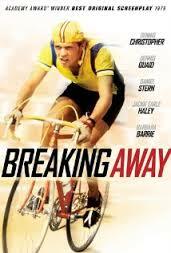 Breaking Away has a gentle soul, the central characters have dreams, but they wonder if those dreams are attainable. Dave’s enthusiastic pursuit of his dream gives all the others hope, and it is the hinge upon which the crowd-rousing bicycle-racing finale turns. Bike racing is the film’s metaphor for escape: to break away from the pack in a race is equivalent to breaking away from one’s familial and cultural history. The film pivots on the question of whether, and to what extent, this kind of breaking away is either necessary or desirable. Nominated for five Academy Awards, including Best Picture and Best Director, Breaking Away won one Oscar, for Steve Tesich’s Best Original Screenplay.